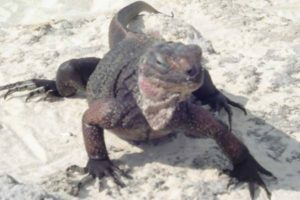 The Allen’s Cay Iguana (Cyclura cychlura inornata) is one of the seven subspecies of Bahamian Rock Iguanas. Allen’s Cay is one of the few places where you can still find these fearsome looking, yet gentle creatures, which are protected by law. They are friendly and welcoming to visitors who bring them gifts of vegetables and other goodies.